Last year’s beaten finalists Mytholmroyd will host league leaders Thornton in the second round of the Halifax Parish Cup. Their tie on Sunday, June 3 was the plum one in last night’s draw, made at the council meeting at Pellon Club. 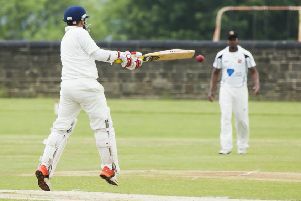 Thornton have already registered a comfortable six-wicket win over their Premier Division rivals this season but the Calder Valley side will have ground advantage for the cup game. Holders Booth and 2015 competition winners Triangle both face opponents they beat comfortably in the league last Saturday. Booth, who overcame dangerous Illingworth St Mary’s in the first round, travel to this year’s final hosts Copley while Bridgeholme may not relish a trip to Triangle’s compact Grassy Bottom ground. Sowerby Bridge have started the season well and might fancy their chances of turning over division-higher Southowram at Walton Street. Shelf Northowram HT will be confident of beating section-lower visitors Blackley. There are two David versus Goliath ties. Warley may need directions to Leymoor, who play two divisions lower, while Outlane face a tough task away to top section sides Sowerby St Peter’s. Oxenhope look home bankers against a Stones side without a win in Division One so far in 2018. Crossley Shield holders Triangle face a trip to Great Horton Park Chapel. Parish Cup: Copley v Booth, Leymoor v Warley, Mytholmroyd v Thornton, Oxenhope v Stones, Shelf Northowram HT v Blackley, Sowerby Bridge v Southowram, Sowerby SP v Outlane, Triangle v Bridgeholme.